This is a guest post by Julie Link. 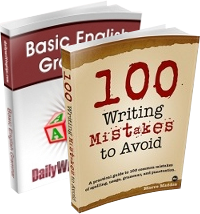 If you want to write for Daily Writing Tips check the guidelines here. “I love France,” my friend sighed, and I nodded my agreement. “I miss not being there,” she added. Huh? My commiseration over lost croissants gave way to puzzlement over this odd expression. You love it, but you regret not being absent from it? A quick perusal of the internet yielded more instances of the erroneous idiom. A headline on .OhGizmo.com laments, “Goodbye, F-117A. We’ll Miss Not Seeing You.” A query posted on WikiAnswers.com asks “How do you say i miss not seeing you in french” [sic]? Dictionary.com defines the verb “to miss” as “to regret the absence or loss of: I miss you all dreadfully.” The definition makes clear that what my friend missed was being in France rather than not being in France. How did “I miss being there” morph into “I miss not being there”? I’ve never seen the expression misused when the object of the verb is a person or a thing. Does anyone say “I miss not my mom?” (Well, perhaps, but that’s a topic for another day.) No, we all understand that that when we miss something or someone, we regret its absence or loss. We miss the warmth of summer, Gran’s apple pie, or a dear friend. The problem occurs only when what is missed is an action: “I miss seeing you,” “The children miss playing at the beach,” or “Nana misses rocking her grandbabies.” Perhaps the error derives from trying to emphasize the regret. Doesn’t not rocking the babies sound sadder than rocking them? But to add the word “not” is to create a double negative. Parsing my friend’s remark, for example, would suggest that what she regrets is being in France; that was not what she intended to convey. The definition of “miss” already denotes a negative—the absence or loss of something—so the addition of the word “not” negates the loss and creates, if not an arithmetic positive, then at least a grammatical confusion. Why this simple expression, so easily grasped that children use it comfortably, becomes so slippery when a few words are added is difficult to explain. An understanding of grammar is helpful; diagramming the sentence (Does anyone do that nowadays?) would demonstrate that whether what is being missed is a person, a thing, or an action, the structure of the phrase does not change. Rather than exposit the grammatical technicalities of gerunds and direct objects, I think I’ll cogitate over a croissant. The only problem is that I miss not counting calories. About the Author: Julie Link is an experienced editor and avid lexiphile who loves reading and writing about language and grammar. She may be contacted at julieolink@yahoo.com. Says what I mean: I miss not having pain. I miss not being in jail. Says the opposite of what I mean: I miss not having pleasure. I miss not being free (meaning, instead, that I prefer pain to pleasure and incarceration to freedom). Regarding your example “I miss not being there.” Logically, this is an impossible statement. If I refer to a place as “there,” then that place is some other place than where I am. At this moment, I am not “there.” How can I miss, or long for, a situation that exists. Although I haven’t come across this illogical phrase before, I suppose it is rather like “I could care less”, which is increasingly used to mean the opposite of its literal meaning. I’m glad you pointed this out, and I love your final sentence as a way of turning this whole problem on its head while still being correct. That’s a great discussion, but isn’t it simpler to say that the word “miss” has now come to mean “regret” or “am/are sorry about”? When those words are substituted for “miss” in your examples, then they make perfect sense. There is an implied pronoun in the sentence, generating the colloquial “I miss math class, it not being there”. “I miss my mom, her not being here”. Sloppy usage, but perhaps understandable. 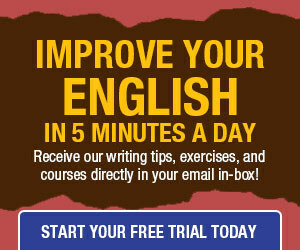 Consider replacing perusal with a word that means to skim quickly, as a perusal refers to an in depth study. I think that the next logical step in this post should be to address “near miss.” People use this expression, at times, when what they REALLY should say is “near HIT.” Meaning, almost hit. If you “almost miss” something, it means you HIT it. At least, to my logic. If you’re crossing the street and you have a “near miss” by a car, it would seem that the car “almost missed” you, but didn’t; in fact, it HIT you. I think I’d rather be “nearly hit” by the car (but not actually) than “nearly missed” by the car, and unable to write this post today. That’s what I get for not knowing my aircraft! If the headline was indeed written with tongue in cheek, kudos to the author for an excellent play on words. Thanks for your comment. I was going to comment that the F-117 is a stealth aircraft, but I see that someone else already did that for me. Regardless, I still don’t see how anyone could make this mistake. Really, “I miss not being there”? Nothing about that statement sounds right. It sounds to me like this: you love France, but you feel like you’re trapped there. These are two conflicting statements. I agree with Maeve on the subject of “near miss”: here the word “near” is not being used as “nearly” (i.e. “they nearly missed”), but as “close” (similar to a “close call”). I sure don’t want to fail to miss the next posting on this subject. ken, yes that would be simpler, but it is not true. That is not what “miss” means now or then. If the convicted tells the judge, “I really miss my crimes and the damage I’ve done”, I don’t think it would come off as an apology. Anything makes sense if you postulate that a word doesn’t mean what it means. “Give me the money or I’ll shoot you” isn’t nearly so threatening if shoot has come to mean “dance with”. But it hasn’t.